Water usage for the Nisshinbo Group plummeted by 60% year on year to 10.5 million ㎥ due to the transfer of the papers business. 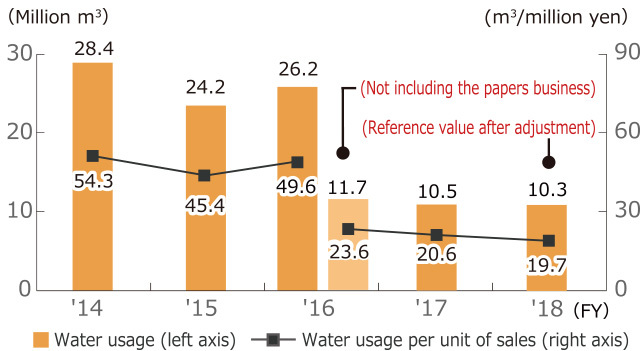 Meanwhile, the volume of water used per unit of sales dropped to 20.6 ㎥ per million yen, down 58% year on year and the amount of water recycled fell to 0.815 million ㎥, down 48%. Excluding the papers business, water usage fell 10% year on year and the volume of water used per unit of sales also fell 13%. 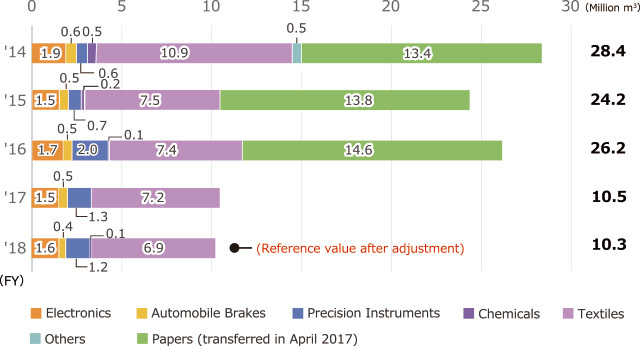 These results were mostly due to progress in effective water resource utilization in the precision instruments and electronics businesses. 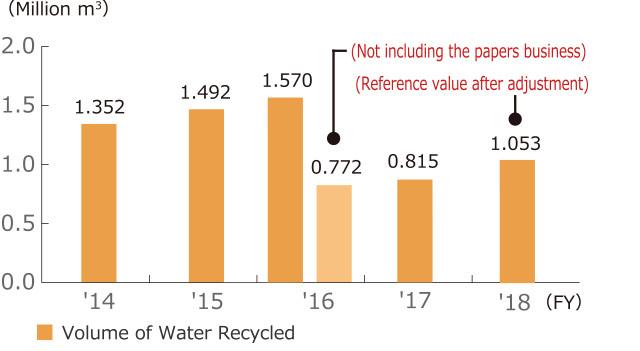 The amount of water recycled rose 6% year on year mainly due to the promotion of recycling at SAGA ELECTRONICS CO., LTD. The textiles business accounted for 68% of total water usage due to the transfer of the papers business, which had been the largest contributor to water usage. SAGA ELECTRONICS CO., LTD. uses a large amount of purified water and tap water for cleaning in its wafer dicing process (the process of cutting integrated circuits off of wafers and making them into chips) and the wastewater from this process contains a large amount of silicone powder. The company had been disposing of its wastewater as black-water but decided to begin reusing the water for cleaning instead of tap water after a three-step process, including precipitation treatment at the time of storage, filtration, and microfiltration (1.0μm filter). Through this process the company was able to reduce both its wastewater and tap water usage by 3,000 ㎥ per month. Nisshinbo Automotive Manufacturing Inc. (NAMI), of the United States, installed a carbon filtration system to reduce volatile organic compounds (VOCs) in its wastewater effluent. This system causes VOCs to adhere to activated carbon, removing them from wastewater, and is also equipped with a sand filter and reverse osmosis system, enabling it to remove impurities such as solid matter. With this system, the company has been able to reuse a portion of its wastewater effluent as industrial water, lowering its industrial water usage per ton of product from 13 ㎥ to 10 ㎥. Using the World Resources Institute Aqueduct*, Nisshinbo Holdings Inc. identified water risks at 35 of the Group’s key sites worldwide and shared this information through its Council of Environmental Supervisors. The Group will promote the confirmation of consistency between identified water risks and actual conditions at each site as well as the assessment of water risks in its supply chain. Nisshinbo Do Brasil Industria Textil LTDA., a subsidiary of Nisshinbo Textile Inc., was registered as a member of the Better Cotton Initiative (BCI) in fiscal 2017, after PT. Nikawa Textile Industry was registered under the same initiative in fiscal 2016. BCI is an NGO that aims for sustainable cotton production and is distinguished by its strategic approach, which establishes concrete targets, including efficient water use, reduction of pesticides, and improved profitability for commercial farms. Many global companies participate in this NGO, including Adidas, H&M, Ikea, Nike, and Levi’s. Moving forward, the Group will continue to work toward reducing the environmental burdens it causes through sustainable procurement of raw materials.